Ya, chiffon cake again!! Among all the flavours, orange & pandan chiffon are my family's favourite. I got this idea from a friend of mine Ann-Ann by adding some poppy seeds to my orange chiffon. 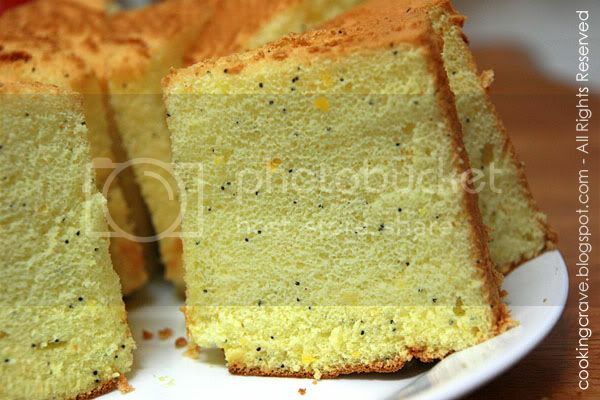 I like it when in every bite of the cottony soft cake there is this crunchy popping sound of poppy seeds. Those who haven't try this poppy seeds in chiffon shall try it now. I added 2 tablespoon of poppy seeds for this cake but it is not that visible after the cake was baked. I think I shall add another tablespoon in it when I bake the cake again next time. I just added 2 tbsp of Poppy Seeds in the egg yolk mixture. You can add more like 3 tbsp if you like more poppy seeds in you cake. 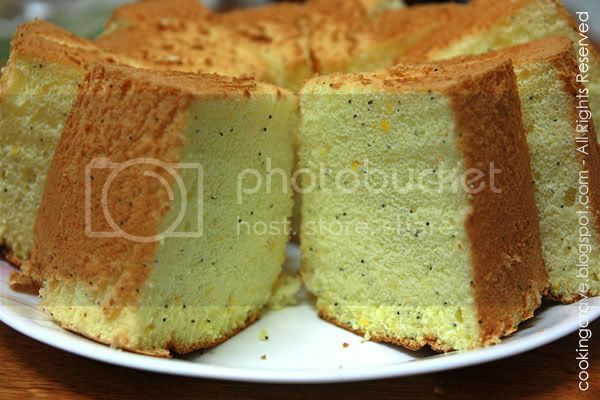 Please click HERE for the "Orange Chiffon Cake Recipe"
I love the flavour of orange in chiffon cake but poppy seed is not allowed to sell in Singapore. Anncoo: Poppy seed was banned in S'pore?? Tracie: Yes for chiffon cake we are not suppose to grease the cake pan. I wonder how you unmould it, did you use a thin knife to run around the cake pan before unmould it? My chiffon also stick on the cake tin. There are few reasons of unsuccessful chiffon. Make sure you beat the egg whites correctly as it plays very important part in chiffon cake. Make sure you over turn the baked chiffon cake immediately after you remove it from the oven. Wait till it's all cool before you unmould and cut it. Have you tried lemon chiffon cake or lemon honey chiffon cake? Can I just change the orange to lemon, will it be too sour? And if I would like to add honey, do I need to change the liquid portion?